Space Pilot is your third person space shooter. 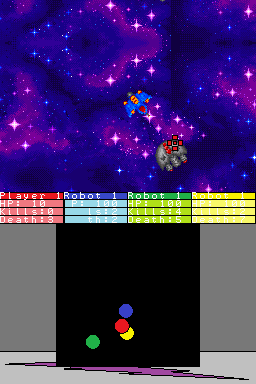 In this game you play as a pilot who's goal is to shoot down all the other pilots. Currently there is only one style of gameplay that is endless. Also it is missing spaceship specifications (all ships work the same) and spaceship selection. I'll try adding bigger and better stuff later. The current version is only single player. It's you against 3 other computerized AI pilots. The AI's aren't the best flyers but have dead on accuracy. Each AI bot has 5 functions ranging from locating the nearest enemy ship, following ships, shooting, evasion, as well as suicide collisions too and more! The game also has a mini map to reveal the location of other ships. On the bottom screen displayed is each player's name and stats (which glitch out some of the letters sometimes). To play aim/set angle of your ship using the stylus. Move forward by holding Up/X and backward with Down/B, and use the L and R buttons to fire. i know the current version is very glitchy and tons of other things need changing, but this is a quick demo i'm posting because i'm about to get real busy and not sure when i'll get enough time to work on it again, so i decided to post it anyways. Enjoy and leave feed back.